Optoelectronics (also referred to as photonics) are various forms of optical transceivers / receiver assemblies, copper-to-fiber media converters, "active" connectors and cables and other devices used to convert digital electrical signals in electronic equipment into optical signals for high-bandwidth, long distance transmission. In aerospace and other demanding environments, optoelectronics are ruggedized for resistance to temperature extremes, vibration and shock. Commercial and military avionic platforms, as well as in-flight communications and entertainment systems, flight displays, and data servers for aerospace applications increasingly rely on high-performance, harsh-environment optoelectronic modules that convert electrical-to-optical and optical-to-electrical data streams at rates from 1 Gbps up to 10 Gbps and beyond. The harsh environmental requirements of commercial and military aerospace (temperature extremes, vibration and shock, EMI shielding, hermetic packaging and so on) are not adequately addressed by commercial-off-the-shelf fiber optic interconnects and transceiver/receiver assemblies. Many other applications also require optoelectronic modules that can operate in harsh environments including spacecraft, military ground vehicles, navy ships, above-ground and sub-sea oil and gas production plants as well as collider physics and nuclear plants. The need for ruggedized photonic packaging in aerospace systems, as well as increased focus on reduced weight and small form-factor technologies, has led Glenair to develop a revolutionary new optoelectronic (photonic) product series that provides photonic transmitter and receiver functions, fiber-to-copper media conversion, and signal aggregation that can integrate directly into interconnect wiring systems. These harsh-environment interconnect technologies — leveraging MIL-DTL-38999 (M29504), Series 80 Mighty Mouse, GFOCA, ARINC 801, MIL-PRF-28876, MT and other high-performance connector technologies — reduce size and weight, and improve the performance of Ethernet, Video and High-Speed Digital in commercial and military avionic applications by leveraging the strengths of both electrical and fiber optic transmission media. 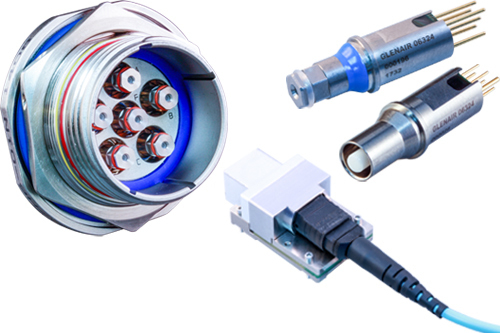 Glenair offers both standard catalog solutions, as well as the integration of electronics or optoelectronics into rugged custom packages and cable assemblies per customer and application requirements. Unmanaged and SMART (customer configurable) Ethernet Switches and Breakout Cables. Standard connector interfaces include high-performance size-and-weight-saving Glenair Series 805 Mighty Mouse and M28876 fiber optic connectors.